Quantity Solutions Inc. was established in 2008 with a vision to create a Filipino engineering company that will serve local and international projects. It was established by Engr. Rynor G. Jamandre, a board topnotcher in Civil Engineering and one of the few Filipinos who is a certified member of the London-based Royal Institution of Chartered Surveyors (RICS) and Engr. Tim Cleveland, a US Military Engineer based in Washington. QSI now employs over a hundred professionals after less than a decade of operations. It upgraded itself into a recognizable brand by implementing ISO 9001:2008 quality systems in 2013. Since its inception, it has completed more than 250 projects, mostly from notable developers in the Philippines and abroad. In 2014, it partnered with Omnium International, based in Dubai, UAE to do multi-billion dollar projects for EMAAR Properties across the Middle East. This opened the doors for QSI to develop capabilities for international projects. In 2016, the company partnered with UK based Turner & Townsend to do multinational corporation portfolio projects in the Philippines and recently with Burns and McDonell of Kansas, USA. To be the preferred Cost Estimating and Project Management Consultancy Company adhering to the highest form of engineering standards while providing cost-effective technology - based solutions to construction projects worldwide. The Company is founded on the value of integrity in all aspects of its operations. Employees are required to comply with integrity checks to ensure honest and credible services. The Company provides opportunities to the employees to become stakeholders of the company and continue to develop their technical & management skills. The Company focuses on research & development driven by the innovative ideas of the employees. The employees adhere to the highest standard of estimating practices to maximize returns to our clients and ensure successful completion of projects. 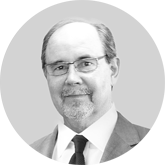 Mr. Aguirre is a business management executive with over five decades of experience in the fields of Accounting, Audit, Corporate Planning and Management Services. 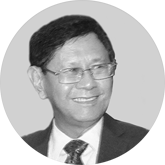 He began his career as an Auditor in the prestigious Sycip, Gorres & Velayo, Co. (SGV) in the sixties where he moved up as Associate Consultant. In the seventies he served as Controller and Corporate Planning Manager for Solid Mills, Inc. and United Textile Mills. In 1969, he established Management Dynamics, Inc. and served as the Senior Vice-President until the 1980s. They managed companies from the commercial and service trades. From 1990 to 2012 he was the President of Singa Ship Management, ranked as one of the top ten manning companies in the Philippines. Singa Ship is a manning company providing officers and crew to luxury cruise vessels. Currently he is also the President of Aplaya Laiya Corporation and Chairman of the Board of Wolfland Resources, Inc. He graduated from the University of the East with a Bachelor’s degree in Business Administration and finished his Masters at the University of the Philippines in 1970. He placed 11th in the Certified Public Accountant’s Board Exams in 1963. 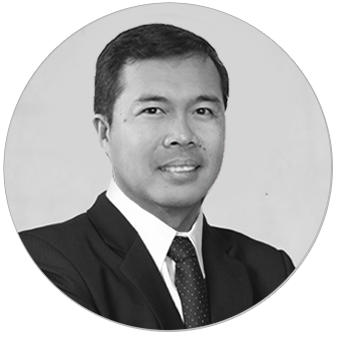 Mr. Jamandre is a civil engineer with 20 years of construction estimating experience from well-known local companies such as DM Consunji, Ayala Land and Pacific International. He has also completed various multi-million dollar projects abroad mainly from the US Department of Defense and US Federal Aviation Administration. He placed 9th in the 1998 Civil Engineering Licensure Exams. He is a professional member of the Royal Institute of Chartered Surveyors and a member of the American Society of Professional Estimators. Some of the notable projects he has completed are the following: Serendra Phase 3, Verdana Homes and Celadon Residences with Ayala Land Inc.; Rockwell Center and International School of Manila with DM Consunji Inc., Bellevue Bohol, Two Seasons Palawan, Alveo Headquarters, Forbes Media Tower, Amata Kabua International Airport in Marshall Islands;; US Naval Support Facility in Diego Garcia, U.S. defense projects in Kyrgyzstan and Burj Vista in Dubai just to name a few. Mr. Cleveland is a seasoned civil engineer from the University of Washington in Seattle, USA. He has more than 30 years of construction experience ranging from private, public and military construction projects. He holds an Advanced Project Management and Negotiations certificate with the US Army Corps of Engineers and is a member of the Construction Managers Association of America and American Society of Military Engineers – Seattle Chapter.